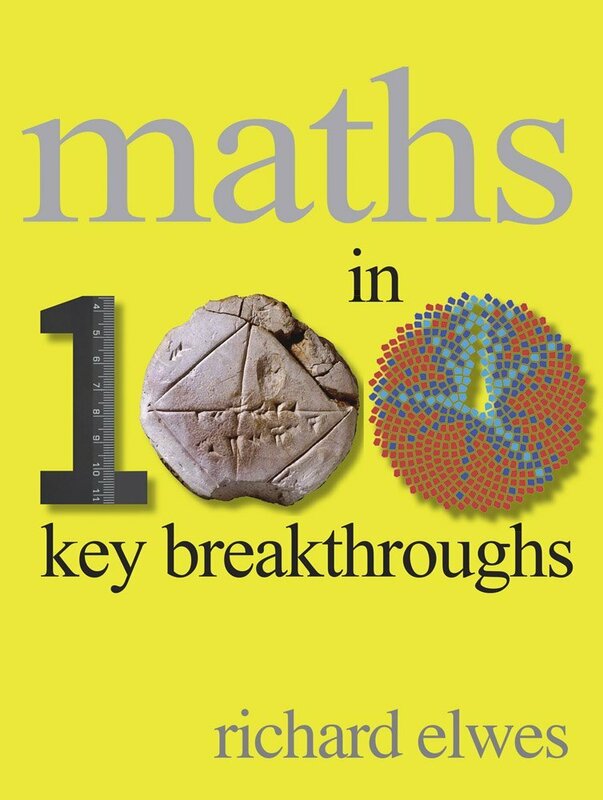 I’m pleased to present a new book: Maths in 100 Key Breakthroughs is published by Quercus and is now available as a softback or e-book. You can read an extract here, and buy it from any of the usual places. As the title suggests, its hundred chapters, ordered chronologically, each deal with a major mathematical development (e.g. Aristotle’s analysis of logical syllogisms circa 350BC, the discovery of transcendental numbers in 1844, and the creation of Weaire-Phelan foam in 1993). My hope is that it should be accessible, attractive, and entertaining to people with little or no background in the subject – jargon and technical notation are kept to a minimum, and each chapter is accompanied by a beautiful full-page colour illustration. My major concern was to avoid wrenching these breakthroughs out of context and artificially presenting them as stand-alone events. After all, mathematicians typically make advances by contemplating the insights of previous generations and answering questions posed by earlier thinkers. Without Kelvin’s conjecture (and perhaps without the work of Pappus and Thomas Hales on related geometrical questions) the discovery of Weaire-Phelan foam would have been less exciting. Equally, it often takes time and further insight for the significance of a breakthrough to become apparent: it was some years after their initial discovery that the deep importance of transcendental numbers was recognised. So I hope that the book not only presents some wonderful discoveries, but also tells the back-stories, gives some sense of what the characters involved thought they were up to, and discuss why their work matters to us today. Really nice, Doc, but kind of pricey, eh? Bought this book today; 3 chapters in and really enjoying it. As a teacher and mathematics graduate, I am very appreciative of the interesting and wide-ranging topics covered (my thesis was actually on the geometry of quasicrystals!) which I could not study at uni. Thanks! In response to your request for errata, I submit that I have found an error on Page 95 of 100 Key Breakthroughs in Chapter 22 – Fibonacci Sequence. The sequence should read …21, 34, 55,… rather than its stated 21, 33, 54. Not sure of the page (80 I think?) but The Euler-Mascheroni constant is incorrectly clamed to be about 0.557 whereas it is 0.577 (to 3 decimal places)…. Hi. Just picked up your book after browsing it at Barnes & Noble. Terrific graphics and interesting stories….love it. I don’t usually buy math texts….mostly physics. There’s an errata on page 81, though. Negative numbers page. The caption for the coldest recorded temperature on Earth was the Vostok research station, and it is Russian but not in Northern Russia. It’s at the Dome A plateau in Antarctica. One of the driest places on Earth and suitable for ground based imaging in the infrared. I believe I calculated your temp to ~ -128, and that has recently been exceeded also…closer to -134 F.
In addition, one of the great physics puzzles is the Koides formula that successfully predicted the correct mass of the Tau lepton. Why it works nobody has yet figured out. Might be interesting to you & your colleagues to tackle. Hi Pete and thanks for the kind words. Thanks too for the correction regarding Vostok. Glad you’re enjoying the book, and hope you’ll continue to do so! Finally, count the number of corners, and denote that number by V (standing for vertices). For a cube V=12…. I believe it should be 8.